There’s a bit of a strange phenomenon happening around the Swim offices. 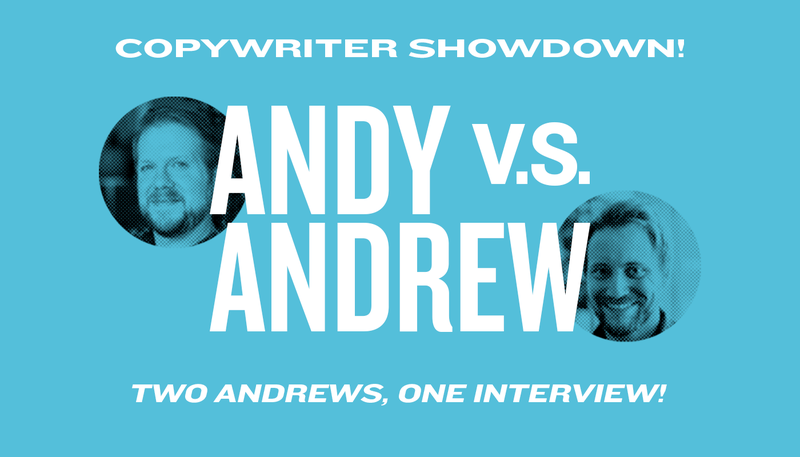 Through some sort of alchemy, coincidence or happenstance, we ended up with two copywriters named Andy. Well, actually, the first one is an Andy, while the newest one is an Andrew. And, Andy, the copywriter who’d been here longer? Well, he didn’t exactly take it well. But, once Andy stopped pacing, slugging coffee and mumbling “there can be only one,” he offered to sit down with the new guy, Andrew, for a one-on-one interview welcoming him to Swim. He promised us he’d be professional. He promised us he was over the whole Andy vs. Andrew thing. This is what happened. ANDREW: Hi, Andy, I’m so glad we have this time to talk. I’m really excited to be working with you. ANDY: (sliding a cup across the table) Sssshhh…drink this. ANDREW: Oh, I’m fine, I already had two cups of coffee this morning. ANDY: (takes the cup back, pours it down the drain) Well played, Andrew. Well played. I guess we should get started with this interview, then. ANDREW: Great! They said this was sort of a getting-to-know you, welcome-to-the-team kinda thing, right? ANDREW: How do you do that with your eyebrow? ANDY: First question: Who do you think you are? ANDREW: Well, I’ve always loved creating stories. When I was in 9th grade, I worked at a video store and saved up to buy an $1,100 camcorder (approximately $42,000 with inflation). From there, I made dozens of ridiculous short films throughout high school (who could forget the critically acclaimed “Night to Dismember” series?). In college, I met Bruce Campbell at a book signing and told him I wanted to make commercials. He asked why. I said “I think I can do it better.” He said “I agree.” Thanks for the confidence, Bruce! ANDY: What a quaint little story. You know who gave me the confidence to be a copywriter? Barack Obama. ANDREW: You met President Obama? ANDY: No, I’m talking about a different Barack Obama. ANDY: Let’s move on. Question two: Why are you even here? ANDREW: I can’t quite explain it, but I always figured I’d end up in Duluth. I have family in the area and it’s been my favorite city to visit for as long as I can remember. I didn’t know when or why I would become a Duluthian, but it has happened. I am here. Swim appealed to me because, after looking at the website and watching a few of their videos, I was immediately drawn to the quality of the team’s work. I wanted to be a part of it. ANDY: (“wakes” with a jerk) Oh, sorry. I was just so enthralled by that riveting response. Question three: Where on Earth did you even come from? ANDREW: I grew up in Litchfield, MN (Go Dragons!). From there, I attended school at the Minnesota State University of Moorhead (Go Dragons!). I wrote a few commercials for a production house in Fargo, then jumped into writing ads full-time in Bismarck and Sioux Falls for a few years. After a brief return to Fargo I’ve become a Minnesotan once more and I’m loving life in this city with the gigantic lake. Seriously, have you seen that thing? ANDY: No, I don’t know what you’re talking about. ANDREW: Lake Superior. The big lake just outside the office doors? ANDY: Never seen it. Question four: Say that someone was looking for someone else after work for no real reason you need to worry about, where might I find you unguarded and unaware? ANDREW: Well, if you’re asking about hobbies, I like to read. You know, novels and such. ANDREW: More importantly, I was once ranked 21st in the United States in the Playstation 3 version of Tetris. THIS CAN NEVER BE TAKEN AWAY FROM ME! Also, I can’t help it, I love professional wrestling. ANDREW: Why do some people love milk bottle collecting? Why do some people like pickles? ANDY: Most people like pickles. ANDREW: Okay. Bad example. But, for me, the stories, the absurd characters, the ridiculousness of it all, I just love it. Plus, you haven’t lived until you’ve seen the The Canadian Destroyer. So, yeah, I guess most nights after work I’d probably be home alone watching that. Why do you ask? The following morning, Andrew and Andy had a meeting with HR, at which point they both realized that “Andy” rhymes with “Candy” and that they both love candy. An instant, deep friendship was forged. If you’d like to work with our dynamic copywriting duo, drop a line! Just be prepared to talk books, candy and professional wrestling.